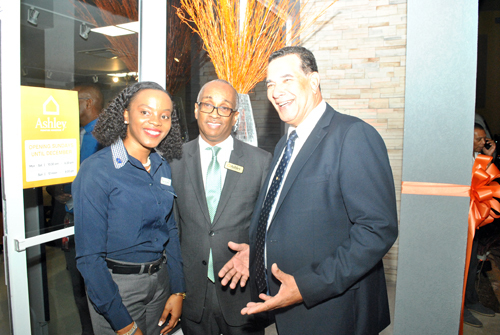 Chairman of the St. James Municipal Corporation and Mayor of Montego Bay, Councillor Homer Davis (right), share pleasantries with General Manager of Ashley Home Store, Pamille Shaw Blair and Unicomer’s Managing Director, Dennis Harris. Mayor of Montego Bay, Councillor Homer Davis, says the time has come for criminals who have been wreaking havoc in the city of Montego Bay and the parish of St. James to be sent a clear message that law-abiding citizens have had enough. Addressing the official opening ceremony for Ashley HomeStore in the Fairview Shopping Complex in Montego Bay on Wednesday November 8, Mayor Davis said citizens have been living in fear of their lives, because of the deeds of a few misguided men. Mayor Davis said despite their activities, which have resulted in well over 200 murders and several hundred shootings across the parish since the start of this year, these persons, mostly men, are not irredeemable. “This is where I use this medium…to appeal to the young men who have embarked on a life of destructing other people’s lives… to say to them –enough is enough. I will say to them that they are not irredeemable but they need to take a stance now to say (they) have killed enough of (their) black brothers and sisters, so let us get a hold on ourselves and make Montego Bay and Jamaica the place that it ought to be”, Mayor Davis implored. Meanwhile, Mayor Davis has welcomed the opening of the international furniture store in Montego Bay, stating that the Ashley HomeStore brand is expected to significantly impact the business sector as well as householders in the city. He said: “I am sure that the citizens of this region are looking forward to great customer service, quality furniture and a lifelong partnership with Ashley Furniture HomeStore, firstly as a member of the business landscape as well as a good corporate citizen. With your wide range of furniture our bedrooms will become more comfortable, we will be spending more time utilizing our dining rooms and entertainment areas while for those of us who work from offices, our time spent there will be more enjoyable based on the quality of the furniture and accessories which we will purchase”. Mayor Davis said the opening of the store sends a clear signal to the business world that despite a number of challenges, Montego Bay remains very attractive, not only as the leading tourism destination in the Caribbean, but as a business location which is now regarded as the hub for commerce in the region. “As Mayor of this city, I am pleased to state without any form of contradiction that business confidence is very high, not only in Montego Bay, but across this parish. Just last week, we opened a major health facility in this area which now put Jamaica and Western Jamaica up-front and centre in the world of health tourism. The opening of this store, will not only bring a new clientele to the city, but will bring wealth to our people through the very attractive jobs being provided”. He added that Ashley HomeStore’s opening is part of the answer to a recent request from the Prime Minister for a new set of investments in order to add fuel to the economy, not only of Montego Bay, but Jamaica, adding that the St. James Municipal Corporation stands ready to play its part in encouraging investors to move into Montego Bay, adding that technology will be applied in that process. Mayor Davis said “the Hon. Prime Minister Andrew Holness last week asked for a new set of investors in order that our economy can grow-this new store is one of those new investors that will help to drive that process. Let me advise other potential investors who may be sitting on the fence that the St. James Municipal Corporation stands ready to play a leading role in facilitating your investments. We recently had representatives of the Corporation and other state agencies successfully participated in a training programme for the new Application Management, Data Automation, (AMANDA) system which is aimed at ensuring greater participation from state agencies in regulating the construction sector. This new system will give more agencies direct on-line access to construction and other development plans with the aim of ensuring approval in the shortest possible time”. Ashley Furniture HomeStore which was established in 1945 is regarded as one of the largest manufacturers of home furnishings in the world having more than 625 stores in 28 countries. The company which started operation in Kingston recently has a net worth of several billions United States dollars and well over 4, 000 employees has operations in over 500 locations worldwide.